Clarins Beauty Flash Balm. I honestly couldn't even hazard a guess at how many tubes of this I have gone through and it has been a constant repurchase for at least 15/16 years. This is a much hyped product with very good reason - it instantly soothes, brightens, hydrates and plumps the skin. Every foundation that I have ever tried works really well over this primer, which is why it will be forever repurchased. £30/€38. Too Faced Hangover Replenishing Face Primer: Formulated with coconut water (and probiotics?! ), this primer really delivers in terms of hydration, yet it isn't at all greasy so I think it would work well for those with normal-dry skin. It is lighter in texture to the Clarins offering, but still hydrates the skin well. It is silicone free but provides a smooth base for foundation and definitely perks the skin up. £27/€32. YSL Top Secrets Instant Moisture Glow: I received this mini sample with one of my Christmas gifts and I was instantly smitten. The texture is that of a balmy cream and it makes my skin feel so silky soft and it looks so plump and youthful. I only need to use a pea-sized amount for my whole face so although this is quite pricey at £34/€40, a tube would last a long time as it contains 40ml. I can see myself buying a full sized tube at some point. Hourglass No. 28 primer serum: I really loved this primer when I first bought it because my skin was both dry and dehydrated. This is not for those who are just bordering on having dry skin - you need to have dry - very dry skin for this to work for you, otherwise you might find that it would be a little too oily and your base may not settle. This has an oil/serum/lotion texture and when my skin is very dry, it just drinks this up and I find that it works particularly well with full coverage or creamy textured foundations. The result is dewy, plump, soft, luminous skin. At £62, this is not cheap but if you suffer with really dry skin and you have problems with achieving an even base, you might like to try it & it also comes in a 10ml tube for £24. By Terry Terrybly Densiliss Primer: Another very expensive primer, but I can't rave about it enough! I am using it very sparingly because I dread the day that I need to decide whether to repurchase! It has a lotion rather than cream texture and absorbs immediately, leaving a smooth, hydrated base for foundation and I find that this is one that does actually extend my foundation wear time. My skin looks more rested and youthful when I use this, but necessarily glowing so it would be suitable for those with combination or mature skin, who don't like to add any extra glow. £79. Natasha Denona Face Glow Primer Hydrating Underbase: This is the most beautiful primer for us dry-skinned ladies! It has a light cream texture that soothes, plumps, nourishes, revitalizes and brightens the skin. If I could afford to wear this as my moisturiser on a daily basis, I would! My skin loves it - it absorbs quickly yet my skin feels soft and smooth and looks brighter for hours afterwards and every foundation looks great over it. This is right up there with Clarins Beauty Flash Balm, in terms of being a favourite and I know that I will repurchase. My only gripe is that it is in a pot rather than a tube, which I would prefer. £30. Marc Jacobs Under (Cover) Perfecting Coconut Face Primer: This has a very light lotion texture, which I think would make it perfect for normal/slightly combination/slightly dry/slightly dehydrated skin, or perfect for those with dry skin in the warmer months. Although it is light in texture, it delivers a good dose of hydration and absorbs immediately. I find that this works well under light textured foundations or CC creams. I love that it comes with a pump, although a glass bottle isn't great for travelling but I can get over that! £30. Charlotte Tilbury Wonder Glow: I adore this primer because not only does it hydrate the skin, it also gives a soft focus filter-like finish - blurring pores and fine lines. It eliminates any signs of fatigue and adds a healthy glow to the skin. The result is hydrated skin with a dewy finish, which is ready for foundation but this also looks great on no makeup days. £38.50/€49. BECCA Backlight Priming Filter: This primer aims to add glow and life to the skin, rather than hydrate it, but I find that it does actually add some moisture to my skin. It is the perfect antidote to grey/dull/sleep-deprived/fatigued skin. It doesn't add any glitter or shimmer to the skin, but definitely adds a glow and basically puts life back into the skin. My only gripe with it is that I find the pump gets clogged up quite easily, but I can get over that because I love the result it gives - dewy, hydrated, youthful and energised skin! £32. 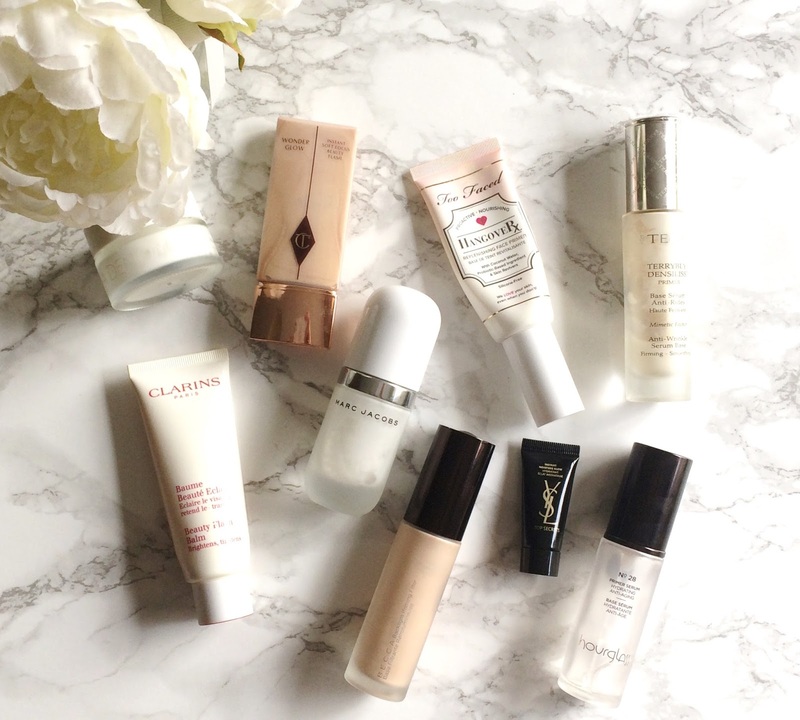 Are primers a necessary step in your routine? What are your favourites? Have you used any of the ones I've mentioned here today? I would love to hear all of your thoughts in the comments below!